Campers choose to focus on drums, guitar, bass, vocals, or keys, NO EXPERIENCE NECESSARY. In one week, campers form bands, write original songs, and perform for our family day. Morning sessions consist of small group instrument instruction, while afternoons consist of band practice. Campers also have two elective activity blocks a day to choose any activity they want. Every day at lunch, different guest artists will take the stage to perform, talk about their work, and take questions from campers. After lunch, along with many activities to choose from, campers have plenty of time to jam, write, and rehearse their band’s songs. "What an incredible week for my daughter! I was so impressed with how happy and proud she was when she came home. The staff are awesome. The interns are super cool. These girls totally rock. We're so in." "My daughter loved every second at camp! The instruction was fantastic, and I was so impressed with the final concert. But even more important was the community -- there was so much love and authenticity among these young women. It's a special place." How do you assign campers to instruments? Campers focus on one instrument/track per week of camp. We sort campers into their instrument instruction class before camp week starts. We take into account the camper’s first and second choice of instrument, student to instructor ratios, as well as balanced band instrumentation. Bands come in many different formations, but almost always have at least two vocalists and one drummer. Do campers ever get the chance to try out other instruments? Yes! Each week offers an instrument swap workshop. 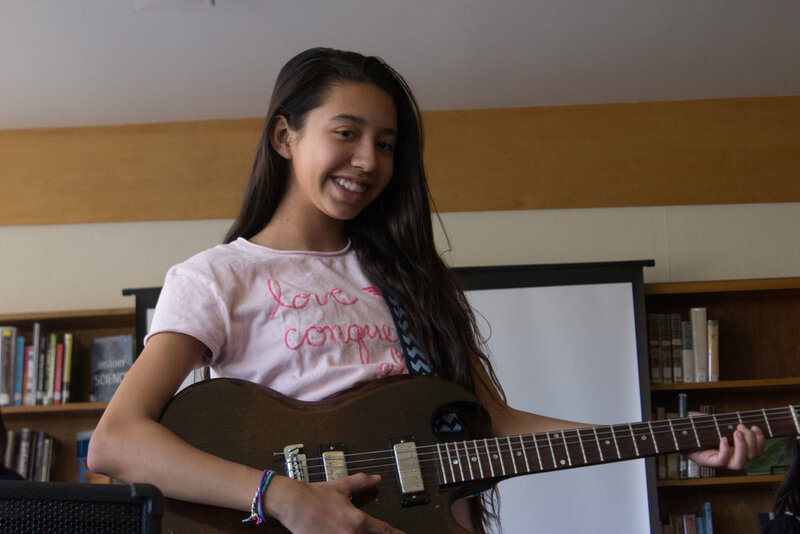 Campers have access to music equipment during at least one session of free time, and with permission from her band and coach, during band practice. I know what a guitar, drums, keys, and vocals are. But what’s a bass?!?! Bass (rhymes with ‘face’) is an instrument similar to guitar but typically with four fatter, lower toned strings, compared to a guitar with 6 lighter strings. Bass is typically a rhythmic instrument, but can be played wildly by anyone with the creative passion, such as Esperanza Spalding, who basically rules a 5 string fretless bass. But we’re sure she started on 4 strings, just like the kids at Camp! Check her out here.